AMSTERDAM, THE NETHERLANDS--(Marketwire - Sep 7, 2012) - IBC 2012 -- Mac professionals will benefit from dramatically improved graphics performance and productivity with today's announcement of the NVIDIA® Quadro® K5000 for Mac Pro systems. Based on NVIDIA Kepler™ architecture -- the world's fastest, most efficient GPU design -- the Quadro K5000 for Mac is the most powerful professional-class GPU ever for the Macintosh, delivering unprecedented visualization and computation capabilities for designers and digital content creators. "The NVIDIA Quadro K5000 has great OpenGL and CUDA performance, so it's ideal to use as a shared GUI and image processing GPU in DaVinci Resolve 9," said Grant Petty, chief executive officer, Blackmagic Design. "Like many artists who use DaVinci Resolve, colorists seek the highest performance possible from their systems, and with just one of the new Kepler GPUs our users will be able to work with 4K imagery on their Mac Pros in real time." "Quadro K5000 for Mac will have a transformational impact on the digital content creation workflow," said Greg Estes, media & entertainment industry executive at NVIDIA. "We're giving Mac Pro users the most powerful professional GPU ever for the Mac, with features and performance that will make a substantial difference in their workflows and allow them to create digital content at speeds never before possible." Follow the NVIDIA Quadro workstation business on YouTube and Twitter: @NVIDIAQuadro. NVIDIA (NASDAQ: NVDA) awakened the world to computer graphics when it invented the GPU in 1999. Today, its processors power a broad range of products from smartphones to supercomputers. NVIDIA's mobile processors are used in cell phones, tablets and auto infotainment systems. PC gamers rely on GPUs to enjoy spectacularly immersive worlds. Professionals use them to create 3D graphics and visual effects in movies and to design everything from golf clubs to jumbo jets. And researchers utilize GPUs to advance the frontiers of science with high performance computing. The company has more than 5,000 patents issued, allowed or filed, including ones covering ideas essential to modern computing. For more information, see www.nvidia.com. (1) Cinema 4K support (4096x2160@24p) available with display devices supporting HDMI 1.4 4K input. (2) Four displays connectors: two DVI-DL and two DisplayPort 1.2. (3) Based on NVIDIA internal tests. 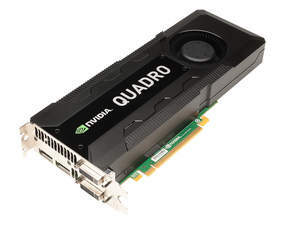 Certain statements in this press release including, but not limited to, statements as to: the availability, pricing, impact, features and benefits of NVIDIA Quadro GPUs; and the effects of the company's patents on modern computing are forward-looking statements that are subject to risks and uncertainties that could cause results to be materially different than expectations. Important factors that could cause actual results to differ materially include: global economic conditions; our reliance on third parties to manufacture, assemble, package and test our products; the impact of technological development and competition; development of new products and technologies or enhancements to our existing product and technologies; market acceptance of our products or our partners products; design, manufacturing or software defects; changes in consumer preferences or demands; changes in industry standards and interfaces; unexpected loss of performance of our products or technologies when integrated into systems; as well as other factors detailed from time to time in the reports NVIDIA files with the Securities and Exchange Commission, or SEC, including its Form 10-Q for the fiscal period ended July 29, 2012. Copies of reports filed with the SEC are posted on the company's website and are available from NVIDIA without charge. These forward-looking statements are not guarantees of future performance and speak only as of the date hereof, and, except as required by law, NVIDIA disclaims any obligation to update these forward-looking statements to reflect future events or circumstances. © 2012 NVIDIA Corporation. All rights reserved. NVIDIA, the NVIDIA logo, CUDA, Kepler and Quadro are trademarks and/or registered trademarks of NVIDIA Corporation in the U.S. and other countries. Other company and product names may be trademarks of the respective companies with which they are associated. Features, pricing, availability, and specifications are subject to change without notice.